Breaking Ground began with a desire to literally ‘dig’ into the football past of the site using traditional archaeology and more contemporary geophysical technology. What started with a world first – the archaeological excavation of a goalpost hole – ended with a trowel as an exhibit in the National Football Museum. It is to all intents and purposes, ground breaking. 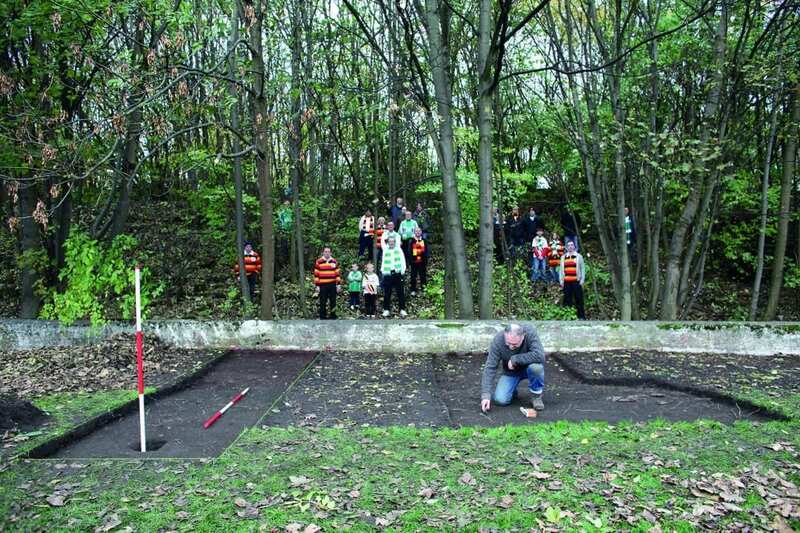 In 2013, the Park Avenue football ground, a long-forgotten time capsule of Bradford’s social history, began to be unearthed by archaeologist Jason Wood and artist Neville Gabie. That first tentative dig convinced them to grab the moment before the ground’s legacy was lost forever. Invigorated by the fans’ enthusiasm, with funding from Arts Council England and the National Football Museum, and with the blessing of Bradford Metropolitan Council, they returned in 2015 with an enlarged team of archaeologists and artists, once again to be embraced by the passionate Avenue fans with their contributions and insights. The exhibition is now on display on Level 1, featuring objects relating to the excavation and in-depth videos outlining the project.